P: As a place you grew up in, how has Hong Kong influenced your work? C: I belong to the post-80 generation of Hong Kong. 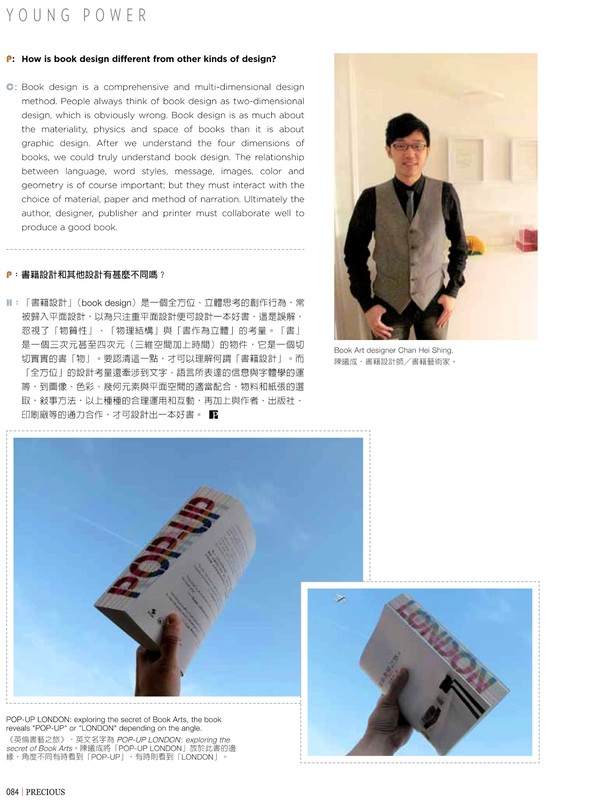 After graduating from PolyU’s Visual Communication, I studied Book Arts in London. Hong Kong was where I first learned design, and London was an inspiring place for me to digest and procee what I have learnt. Life in London was like life in front of a shining mirror. Under the different cultural context, I saw my own body, soul and identity in a clearer light. My graduation artwork moon. under. alone. drink. was inspired by Li Bai’s work Drinking Alone with the Moon. The five books and posters narrated my unique story in London. P: Who inspired you the most these years? C: I once went to an exhibition called “Vibrant Books: Methods and Philosophy of Kohei Sugiura’s Design”. Frankly, I was awe-struck by Mr. Sugiura’s works. His designs in the 60’s and 70’s were way ahead of time, and they seem contemporary even now. His design philosophy, feel for books and hands-on approach were really impressive. 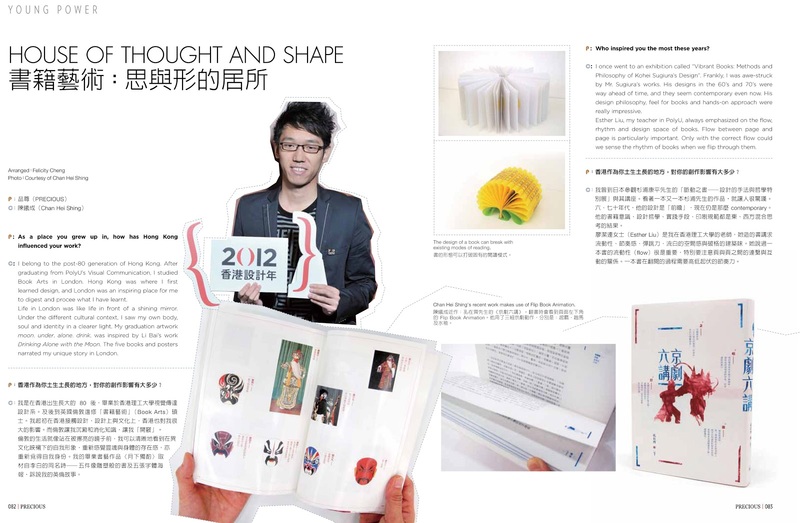 Esther Liu, my teacher in PolyU, always emphasized on the flow, rhythm and design space of books. Flow between page and page is particularly important. Only with the correct flow could we sense the rhythm of books when we flip through them. P: How is book design different from other kinds of design? C: Book design is a comprehensive and multi-dimensional design method. People always think of book design as two-dimensional design, which is obviously wrong. Book design is as much about the materiality, physics and space of books than it is about graphic design. After we understand the four dimensions of books, we could truly understand book design. The relationship between language, word styles, message, images, color and geometry is of course important; but they must interact with the choice of material, paper and method of narration. Ultimately the author, designer, publisher and printer must collaborate well to produce a good book.